Of all of the things that make up the structure of any building there can be nothing more hidden, yet nothing more essential than the drains and sewerage pipe. If you have any doubt about just how essential these pipes are - ask someone who has recently been flooded out, or who have had their drain blocked up. From long exerience, we at Fred Stoddart fully understand the essential nature of these services and the need to respond quickly and efficiently when things go wrong. As a local business servicing the North East of England we can be on site quickly to tackle the immediate problem using our high pressure water system. High pressure water jetting is a fast and effective way to clear any drain blockage. This is why Fred Stoddart has a dedicated high pressure mobile cleansing unit that can be quickly sent out to your premises as soon as it is needed. Whether it be a build up of material or one specific item, the high pressure water simply blasts the blockage apart - washing it away down the drain as normal. This simple, but highly effective approach is the quickest way to get the drains back up and running and (we have to say it) remove the inevitable smell. Having all the equipment we need in-house makes it so much easier to deliver our expert service quickly and efficiently. As a local business we do not need to travel far, or carry national franchise, or marketing costs so not only is our service quick, it is also cost effective. This means that while we help you get rid of the soil, it will not cost you the earth. For the future, it is always good to know why a blockage occured and what can be done to prevent it happening again, which is why we also offer drain inspection. 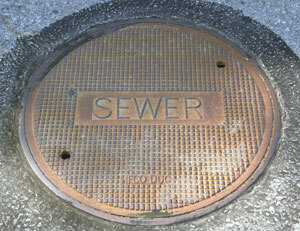 You will not be surprised to learn that inspecting drains is not very pleasant, or very easy. Fortunately we live in age where a specialist business like Fred Stoddart can invest in the equipment to make this unpleasant job much easier and more effective. Our remote camera inspection equipment can be fed into a drain to carefully survey it for any signs of cracking, or other damage that might cause a blockage. For larger drains this avoids the need to go into the drain and for narrower drains it makes internal inspection possible without the need to pull up flooring, dig holes in the garden, or dig up the drive. Drain inspection is not just useful when there has been a blockage, it can provide peace of mind in any circumstances and we often undertake surveys before a property is purchased as part of the main survey, or even independently. 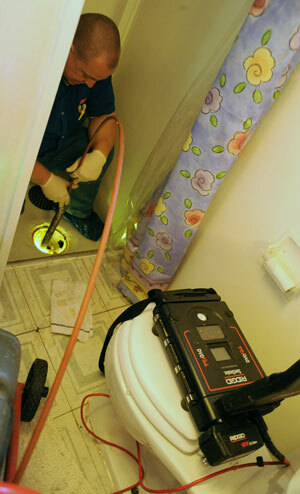 It is good to know that your drains are in good order, but it is also good to know if anything is wrong with them. The Fred Stoddart drain inspection service will put your mind at rest if everything is in order, but it can also be re-assuring to have an expert on hand when problems are discovered. Drains block for lots of reasons and often because of careless use. However, everything ages and over time and wear and tear can cause a range of problems with a property's drains. Some of these problems can be repaired, some of them are caused by previous repairs and some will require whole pipe changes. 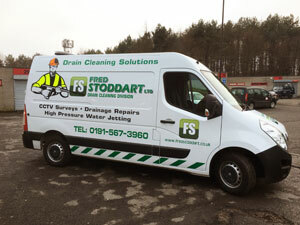 With Fred Stoddart personnel you will have the reassurance of a local business that can respond quickly to faults, fully inspect to get to the bottom of the problem and deliver expertly any repair to keep your drains in good working order. If you suspect that your sense of smell is now working much better than your drains, please get in touch for a speedy and expert resoultion of your drain maintenance problem.